Thanks. I’m not quite happy with the “poems” (plural) but the “bird” (singular). Seems like they should match. I fiddled the second line to keep the “like” and not run out of syllables … but I’m wondering if “you wait in patience / stillness. the poem alights / a bird on your hand” wouldn’t be better, the like implied and the line break doing most of the job for me. And the word “like” has a harsh metallic sound, nice to get rid of that beastie. Yes, I think I like the revision better. This is beautiful. 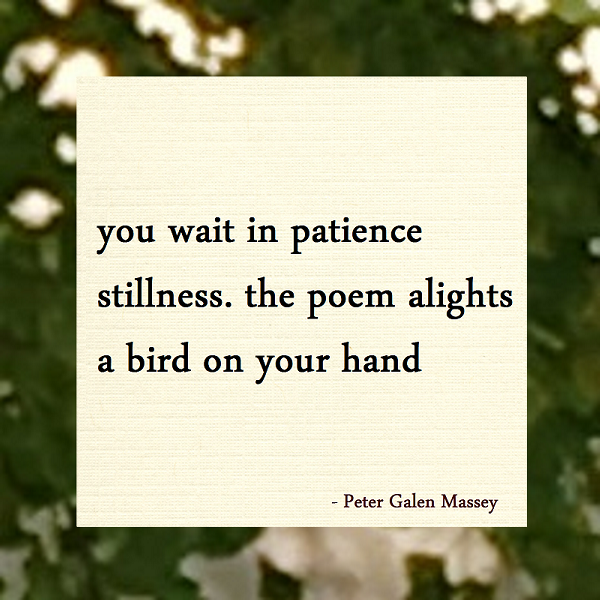 The incredible directness of the poem and the bird as one entity/experience.